Spray and Wipe are two cleaners who have been hired for their most exciting job ever, cleaning a magician’s house! But when they accidentally let the magic out of its box, everything is turned topsy-turvy. Now, the audience must help Spray and Wipe think of a plan to get the magic back in the box before the magician comes home, as her house gets messier and messier! The best of circus, slapstick and magic combine in this very special adventure for primary school aged children and their families. Fantastical fun, with waterproof ponchos provided for those in the front row. Please note children under 14yrs must be accompanied by a parent or guardian. 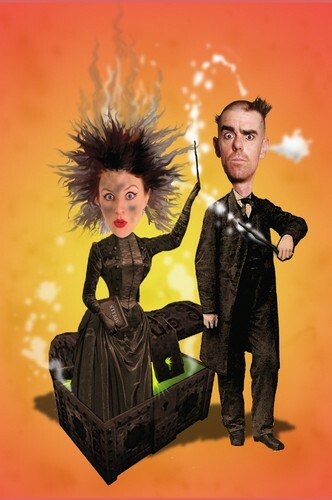 “A warm and witty family-friendly show that offers some genuine surprises. In between the physical comedy, the call and response, and the delightfully cartoonish character work, there are well-incorporated magic tricks that have the little kids going ‘whooooa!' and the adults scratching their heads. Certainly, there's a clear narrative arc and some conflict, especially as the initially fastidious Spray gets a taste of messy magic and goes a bit mad with her newfound powers, leaving the irresponsible Wipe to step up and demonstrate some leadership skills, but all this plays out in a terrifically unexpected way. I'm a sucker for a good kids' show at the best of times but I particularly enjoy this piece, and even as the creepy solo adult in the room I find myself grinning and regularly laughing out loud at the duo's outrageous attempts to get the job done. Oh, yeah, the kids all have a great time too.